What is the Jr. Ranger Program? 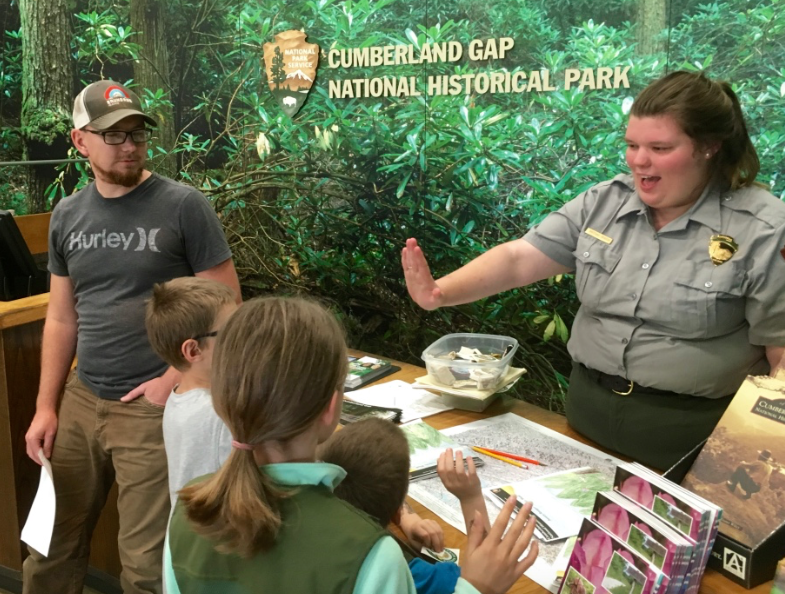 The National Park Jr. Ranger program has been a fun way for our kids to go a little deeper into the history or science behind the National Parks we visit. Participation involves completing a predetermined number of pages within a Jr. Ranger booklet (provided at the visitor center). Some activities may include watching a video, going on a hike, observing nature, drawing a picture or attending a Ranger led program. Upon completion of the booklets, Jr. Rangers raise their right hand and are sworn-in by promising to protect the National Park system, obey their parents or eat their vegetables (it all depends on the personality of the ranger on duty). Finally, a free badge and certificate of completion is awarded and there are smiles all around. Our daughter (11) has been participating in the Jr. Ranger Program through the National Park system for a few years. Our younger two (5 and 7) have recently joined her. In our family, a green ranger vest is awarded once five badges have been earned. Now all three of them show up vested and ready for serious park business when we enter a new visitor center. Call me crazy but there is something seriously cute about seeing these three walk around all vested up with badges clinking. With the exception of the Smoky Mountains National Park (which charged a few dollars per book), all ranger booklets have been free. Small pencils are typically provided as well, however this is not always the case (Mt. Rushmore did not), so it is good to keep a few extra in the car just in case. Activities in the books often provide a great overview of the park. Details about what make the park unique are often presented in an age appropriate way. The Park Rangers have been very kind, supportive and encouraging to our children at all of the parks we have visited. Our older son almost opted to participate with the plan to sell his newly earned badges on eBay for a profit. We noticed that Jr. Ranger badges can sell for around $5-$8 so if you have a budding entrepreneur this might be the angle that intrigues them most! Depending on the length of time we have to visit a park, we have occasionally felt almost enslaved to the completion of the booklets, especially if the required number of pages is on the upper end and our time in the park is on the lower end. I therefore really appreciate parks that say “complete as many pages as you like” in order to qualify. Some of the pages are more along the lines of what I would consider to be “busy work”. For example, some children really enjoy word searches but I don’t consider them to be highly educational and yet they seem to be a very popular inclusion in the booklets. If you have multiple children, try paring up youngers with olders to help work on the booklets. Most booklets are geared for ages 4-12 however all ages are welcome and even adults can participate. I recently heard from one mom who has been earning badges right along with her kids and said that made all the difference in their motivation. I recently learned that the Jr. Ranger booklets are typically able to be accessed on the National Park’s website and printed off at home. This could prove to be very useful if our time in a park is going to be short and some activities could be completed ahead of time. Keep in mind that if you don’t complete your booklets before you exit the park, you can mail them in. A ranger will review your child’s booklet and send their badge in return. We have not done this yet but have heard positive things from others who have–including a hand written note of congratulations from the ranger and some fun extras! Ranger vests cost about $35.00 but we’ve found that this varies by a few dollars depending on the park. I’ve also noticed that not all parks carry every size on hand at all times. In addition to that, most parks don’t have sizes that accommodate children much older than 10. Therefore, if you are hoping to purchase a vest for an older child, keep your eye out at each visitor center gift shop and perhaps check on eBay for a used vest. Purchasing an $80 America the Beautiful annual pass is a great value if you are going to be visiting several parks in a year. However, it might be worth researching ahead of time the entrance fee of parks you plan to visit. We’ve been surprised at how many parks have been free. In general it’s the larger National Parks that charge an entrance fee while a lot of the National Monuments and Landmarks that we have visited have been free. If you have a 4th grader, be sure to take advantage of the Every Kid in a Park program. During your child’s 4th grade year your entire car load of family and friends can visit ANY participating National Park for free by simply filling out the form online and printing your pass ahead of time (homeschoolers are eligible as well)! There are over 200 participating Jr. Ranger Programs in the National Parks service (click here for the complete list). National Parks are not the only location in which badges can be earned. National Monuments like Mount Rushmore, National Historic Landmarks such as Pompeys Pillar or Lincoln’s Home or even National Memorials such as the one in Oklahoma City offer the program. Don’t overlook State Parks, they often offer a similar program as well. We always ask just in case and more often than not the answer has been yes. 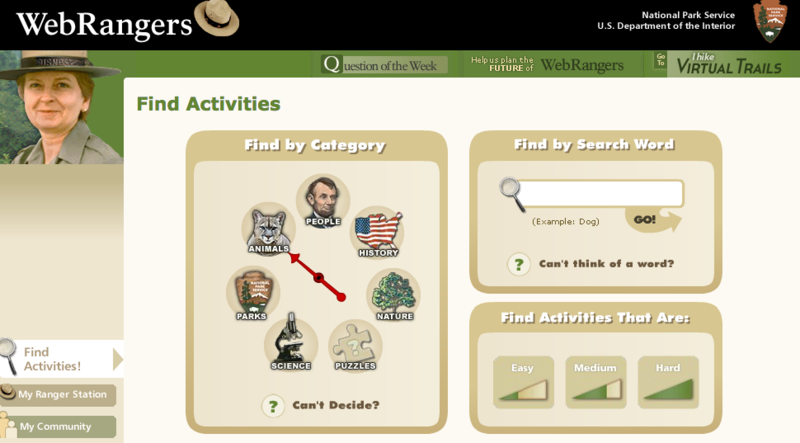 In doing research for this post, I discovered a neat WebRanger program that allows your child to explore parks remotely and participate in a variety of activities in different degrees of difficulty. Our full-time RVing friends Trent & Siobhan did a YouTube vlog when their oldest son earned his first Jr. Ranger badge at Mammoth Caves National Park and another when three of their boys earned badges at the Buffalo River National Park. Hop on over and watch to get a little feel for the process. Finally, Currently Wandering has written up a fabulous list of the Jr. Ranger programs they have participated in (current count is a whopping 105!). I love the simple summery of the parks and if they found the booklets/requirements to be time consuming and if (as a parent) they enjoyed them. How about you? 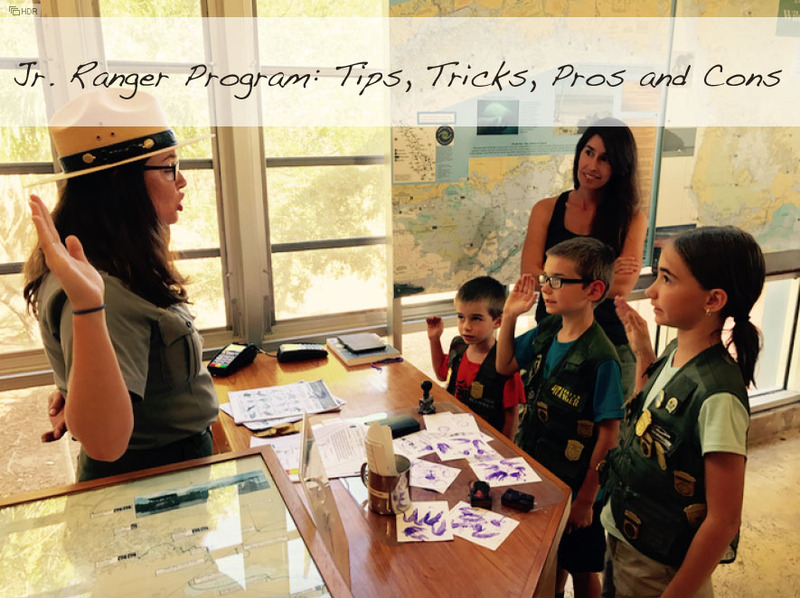 Have your kids tried out the Jr. Ranger program? What has your experience with it been? What have been your favorite National Parks to visit? Don’t overlook National Wildlife Refuges. I’ve written many of them where we have volunteered. If there is not a Visitor Center just stop in the Office and ask. They are a great way to learn about Enviromental Ed. This is a great point Linda, thank you for mentioning that. How cool that you have been involved in writing them up! There are other parks that charge for the books. Zion and Bryce do, but I do think GSMNP is probably the most expensive. But, as they explain it, the trade-off is that there is no park admission cost. I would recommend making sure people know they can purchase an annual pass, and that 4th graders are eligible for a free pass with the Every Kid in the Park Program. I’m pretty sure there are more than 200 badges. We have 145. And there are almost 420 parks. Some parks have multiple programs, like the North and South Rims of the Grand Canyon. The National Parks East umbrella represents 98 different sites across 12 parks, so there are multiple badges to be earned in the DC area. Parks such as Oxon Farm and Kenilworth Aquatic Gardens. There are many specialty programs as well. Such as Underwater Explorers, Night Sky, Junior Paleontologist, Underground Railroad, just to make a few, that are offered in select parks. This past year, they had the Centennial Program and the 50th Anniversary of the National Historical Preservation Act. Some parks, like Padre Island, offered their own unique centennial badges instead of the standard centennial badge. Some parks still have supplies available this year. Some regions offer special rewards if you earn all the badges from the area. Such as the Western Pennsylvania patch for their 5 parks, or the Kentucky Patch for their parks. In South Carolina, you can earn the Overmountain Victory Badge by visiting multiple sites associated with the Southern Campaign of the Revolutionary War. Some places, like Kennesaw Mountain, offer full Junior Ranger swag bags. Others might have patches instead of badges, like Friendship Hill. Other parks may offer letterboxing, geocaching, scavenger hunts. Thank you so very much for taking the time to share your vast amount of knowledge and info! I’ve added some of your details directly into the post. Do you blog? If you’ve written anything about this topic let me know and I’ll link to it! We will be headed up the east coast this year. I’d love to know your favorite not-to-be missed National Park locations. We love the Junior Ranger program! 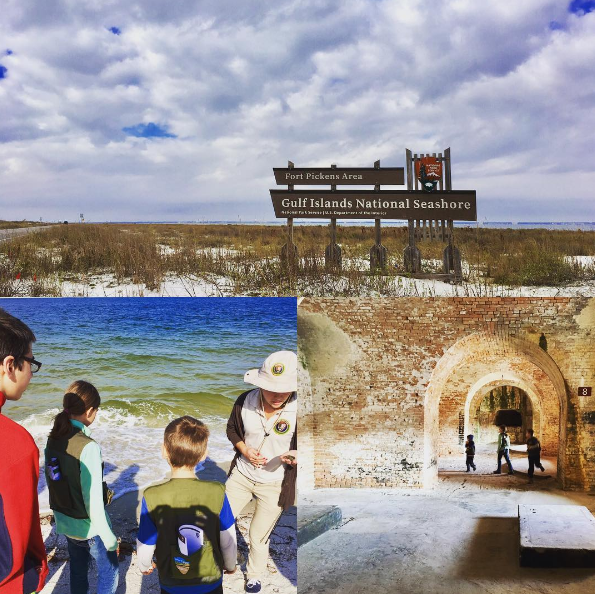 It has been our experience that some state parks offer Junior Ranger programs as well. Yellowstone also charges for the packet, but you get an awesome badge and pencil to go with it. Good to know! I was taken back by the charge at the Smoky Mountains but hearing it isn’t the only park to make you pay will help prepare me in the future :). Great review! Yellowstone NP also charges. We loved the Jr. Ranger book at Gettysburg. Thank you :). I’m looking forward to Gettysburg! Well that sounds extra awesome, thank you for that tip! Jamestown settlement also charged a fee for the book. And, we just visited a park with adult sized vests! Maybe Big Bend? It would have to be either Big Bend, Carlsbad, or White Sands, bc those are all we have done this week. I’m glad to know that about Jamestown–it will mentally prepare me :). Adult sized vests?! Well now, maybe I will need to join in on the fun! Did you buy one? Don’t forget to go online to print off the specialty programs (Underwater, Night Sky, Archeology, etc.) Mail them off to the given address in the booklet you have printed, and you will get it sent back with their patch. It does take some time to get these back. Be patient!! Also, Revolutionary War, Civil War, and Civil Rights sites have trading cards!!! So cool to collect them…rangers will make you earn them. 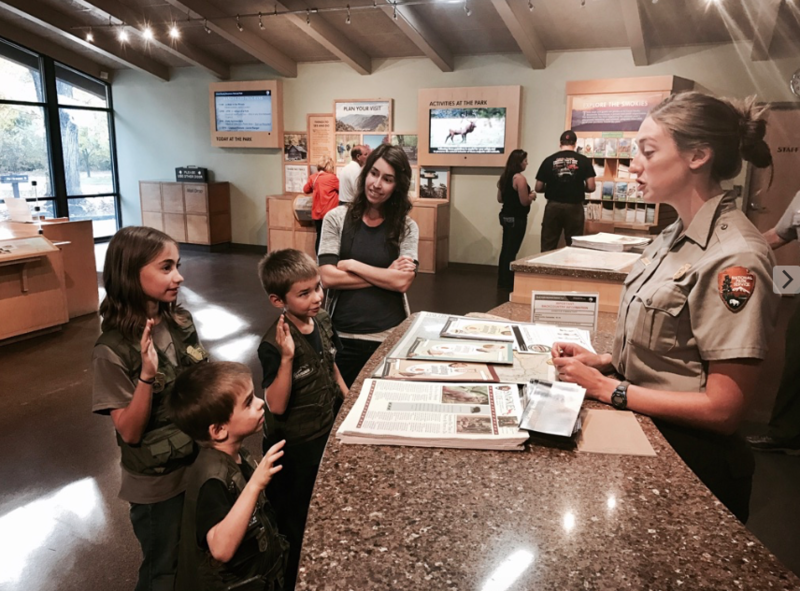 They don’t just “give them to you.” You can earn by either completing your booklets or answer a question about the park you are in if you see a ranger out and about. Fantastic info, thank you Crystal! I didn’t know that about the trading cards, we will have to do that. 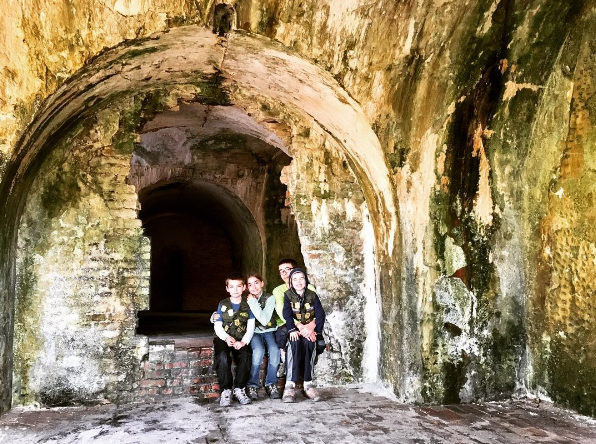 Pingback: What is the National Park Junior Ranger Program? Note: Did you know Jr Rangers don’t have to be children! My daughter and I started doing them together when she was little… and we just never stopped. Now that my husband and I are usually sans kids, I just did one at Joshua Tree all by myself. There’s a lot of good information— and sometimes the younger sections are more interesting and relevant than the word scrambles and searches in the older kid sections.